Good News ... I made it into the Top 10 projects from the May Arts Summer Nautical Challenge!!! Yay! 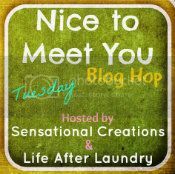 As a new blogger and new at entering crafting contests this is really exciting for me! There was a Grand prize winner there and her project was fantastic! You can find the links to May Arts in my previous posting or just click the May Arts ribbon linky to the right >>>. Since I love to celebrate I thought that I would sneak in a couple of Easter Cards I made this year. I'm really playing "catch up" here so please excuse me if it seems out of context for this time of year. They were from some of my earliest cards and they look pretty rough around the edges. But I love experimenting with making new things and the best way we learn is from trial and error! 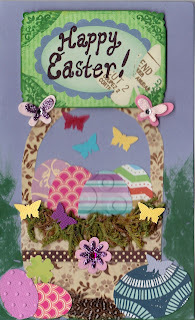 The second card here was also a mixed media experiment for Easter. It's mainly made from Graphic 45 paper (Ye Old Curiosity Shop I think). 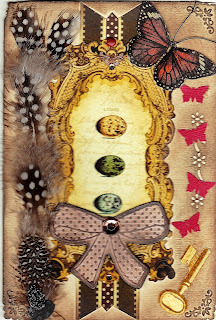 I was going for a vintage card but was unhappy with the tiny red butterflies on the right. I do however adore the large butterfly. I used black Coats cotton thread for the antennae! I love the feel of the feathers and should have used them on the other side as well. The key is out of place I think so I would eliminate that as well. And I think I would use a real ribbon bow instead of a chipboard bow. Otherwize.. I love this card. I embossed the outer corners with my Fiskars embossing corner punch and ink distressed the surface of the card in pine cone brown. I hope you liked them and can find something in them that speaks to you. Please leave me a comment and let me know what you think!